“I speak Eengleesh, I learn it from a boook”. 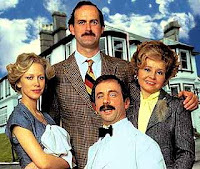 So says Manuel, the Spanish waiter in the classic 1970s comedy series, Fawlty Towers. The fun and games that ensue from his inept attempts to communicate suggests that certain skills require more than just a book. 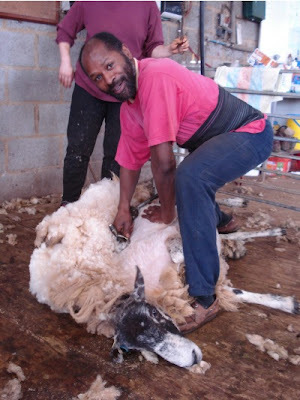 From our own experiences, I can tell you that sheep shearing is one of them. In our first year keeping sheep, we only had a ewe to shear as the ram had been clipped before he arrived and the lamb didn’t need a haircut. With help from our friend Renée, we trimmed our ewe with a pair of dog clippers, while she calmly stood upright, with a dog collar and lead on: not your standard method. The following year, with a ram and four ewes to do, we borrowed some Heiniger electric clippers off neighbours Paul and Christiane and downloaded some instructions from the Internet. Gabrielle then stitched together Dolly, a “sheep” cloned from a selection of soft furnishings for me to practice positioning the sheep and moving my feet around, which is essential to master. I then sheared our sheep with increasing levels of success; that said, I realised I needed to learn how to do it properly. 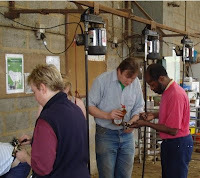 Which is why, last Saturday morning, I found myself in a classroom in the immaculately sprawling Moulton Agricultural College in Northampton with a friendly and diverse group of trainee shearers. 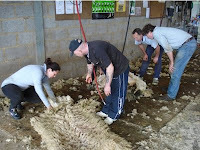 Within the first five minutes, I’d learnt enough about how to set up the comb and cutter in the shearing head to justify the cost of the course. Paul, our instructor, showed us diagrams and told us the theory of how we would manoeuvre the sheep, controlling it with hand, feet and knees and, in no time at all, we were heading for the shearing shed. 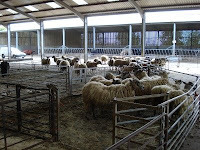 There’s no way of easing oneself in gently—“today, we’ll start you off shearing the back leg”—no, we each had to grab a whole sheep out of the pen, pull her head round towards her back while simultaneously pressing down firmly on her rump, the goal being to put her on the floor, so she can be dragged into a seating position. Think of it as a sort of sheep judo. And then we got stuck in, shears chattering away, wool peeling off and, every once in a while, a sheep saying "I've had enough of this nonsense" and making a break for freedom. I’ll tell you more of how we all got on in my next blog. 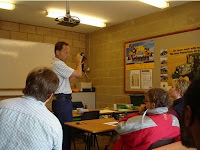 The photos show: our brief classroom introduction, setting up the equipment, expectant sheep, and two pics of us shearing. The guy with the huge smile is Ken, an expert, high quality tailor who was experiencing the very beginning of the process that results in the cloth he cuts for suits (that's also him in the video at top).